Dog Digging Problem - what to do ? Dog digging problem is only a problem for you, your dog loves it. 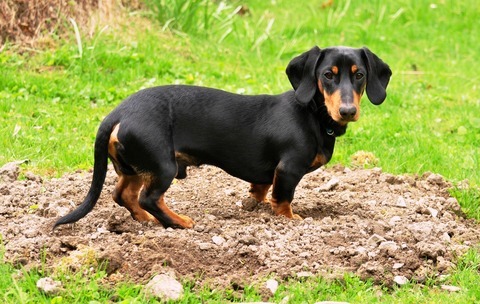 Dachshunds from their hunting and burrowing ancestry were breed to chase, dig out and kill badgers and small rodents, so digging is a natural instinct and they do it very well. Why do dachshunds dig ? They may be burying bones or toys.They seem to enjoy digging up your plants possibly even the ones you have just planted. If dogs are left outside in the hot sun, without shade, they will dig a hole to lie in to get cool. Maybe they just feel like a digging session because they are left alone. Most dachshunds love to dig. Spend quality time with your dachshund, grooming, play catch and other games. Increase your exercise time with your dachshund and go to interesting places. 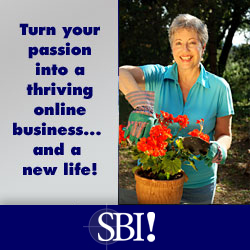 To save your flower beds and veggie garden, you could use a deterrent spray which smells and tastes horrible to dogs. Provide a good variety of toys, interactive, chewing, throwing and rotate them regularly. Make sure your dog has a shady spot if you leave him outside when you are out. 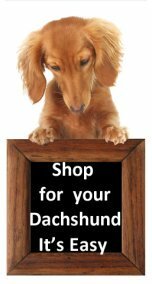 Consider enrolling your dachshund in a Doggie Day Care that provides an interactive program. If you feel nothing is really working then you could provide your dachshund with a digging pit, similar to a child's sand pit, where he is allowed to dig to his hearts content. Along these same lines, you could always install dirt-less, pet and family friendly fake grass and that should cure the digging problem. When you catch your dachshund digging growl, remove him from the area and interest him in another direction, reward alternate behavior, return alone to fill the hole and spray with deterrent spray. If you arrive home to a new hole – fill it, spray with deterrent spray and install a dog digging pit. If you are unable to remedy this problem yourself using dog behavior training methods, it may be best to consult a professional dog trainer who specializes in dog behavior problems or enroll in obedience training class.